Busse Takes Down Event No. 47! Owen Crowe and Shawn Busse were pretty close to equal in chips when one hand nearly ended the heads up battle. On that hand, Busse raised to 200,000 from the button and Crowe called. On a flop of 8 5 5 Crowe led for 275,000 and Busse popped it up to 725,000. Facing a reraise, Crowe reached for even more chips and raised to 1.54 million. Busse put the period on the raising war by moving all in. “I guess you got aces,” Crowe said, then called. Busse held pocket aces but Crowe had the flush draw. The turn brought the K and Crowe needed a heart or else he would be completely crippled. It wasn’t to be, as the 4 hit on the river and Busse took a pot that gave him 9.1 million to Crowe’s 240,000. Crowe took $300,494 in his third, and deepest, final table run. Crowe had the lead and hit part of the flop that ran 6 3 4 . Ikonen needed to see some paint but the turn and river came 2 2 and he was eliminated in 3rd place, making $212,600 for his solid showing. The knockout left Owen Crowe and Shawn Busse heads up. Between the two of them they had eliminated every player at the final table except one. Crowe had a 2-1 chip lead going into heads up against Busse, with 6.2 million to Busse’s 3.1 million. It was close, but Ikonen held the edge. The flop came A A J , changing nothing. The 5 on the turn left Jin in need of an eight or six. The 9 came on the river and Ikonen’s two pair took the pot and booted Jin in 5th place for $112,720. Ikonen had around 2 million in chips following the hand. Pekka Ikonen raised to 140,000 from under the gun and Chuan Shi raised to 350,000 total. Shawn Busse got out of the way and Owen Crowe pushed all in. Crowe held the bigger pocket pair and Shi was in serious trouble. The board ran 4 2 2 5 A and Shi fell in 4th place, making $153,935. Crowe had 5.2 million in chips following the hand and took the chip lead into three-way action. The final 5 players are now on dinner break. Stay tuned to CardPlayer.com to see how it plays out. Following a short break, Shawn Busse made sure he would remain toward the top of the leaderboard. He used pocket aces to secure a healthy pot and knock short-stacked Ilya Andreev out of the event. The flop was 5 7 6 , offering no help to Andreev. The Q turn card gave him some outs but the 8 river sent him to the rail in 6th place. He made $83,498. Busse had 2.3 million in chips after the hand. Adam White arrived at the final table as the chip leader, but after getting involved in some big pots early he found himself short on chips and all in for his tournament life against the always dangerous Owen Crowe. The flop missed both players, running 7 6 2 to keep White’s king high in the lead but provide Crowe with a straight draw. The turn brought the 4 and Crowe had even more outs. The river didn’t provide Crowe with a straight, but it gave him the 9 to make a pair. Crowe took the pot and White was the first victim of the final table, finishing in 9th for $36,287. Crowe had 2.8 million in chips following the hand. Allan Baekke, the 2010 EPT Snowfest Main Event winner, was the next player to go. It was time for a coin flip. The flop ran 6 Q 2 and Busse’s sevens were still ahead. The turn was the Q , giving Baekke a flush draw. The highly anticipated river was the 6 , and Baekke missed his outs. Busse’s two pair were best, eliminating Baekke in 8th place for $47,379. Busse took a nice pot and the chip lead, with 3.3 million in chips. Mann’s hand was dominated and he found no signs of life on the 4 8 2 flop. The 3 on the turn left him dead to a queen and the 6 sent him packing on the river. His 7th place finish earned him $62,553. Crowe soared into the chip lead with 3.6 million. 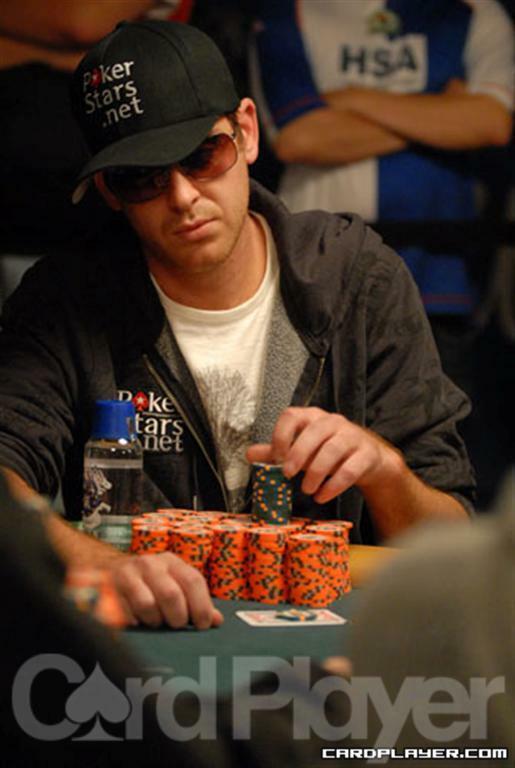 Owen Crowe finds himself fourth in chips and will make his third appearance at a WSOP final table. He will be in search of his first bracelet. Stay tuned Wednesday at 2:30 p.m. as we bring you all of the elimination hands from the final table.